Update: Now with 100% more awesome mugshot action! Yeah, he looked really sober. Probably not guilty. He looks like Jack Nicholson’s drunk chubby little brother. You see the key to looking sober is to cross your eyes and give the camera a creepy sly smile. This may be the greatest St. Louis mugshot since Ozzy Osbourne. 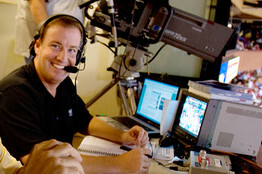 Dan McLaughlin, Cardinals TV broadcaster on Fox Sports Midwest, was pulled over and arrested on suspicion of drunk driving Monday night after refusing to submit to a breathalyzer test. The officer suspected McLaughlin had been drinking and requested McLaughlin take a breathalyzer test. 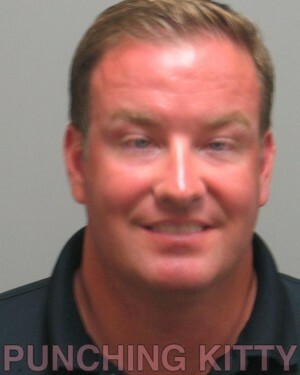 McLaughlin refused and was arrested, [Chesterfield police Lt. Steve] Lewis said. He was taken to Chesterfield police headquarters for booking and later released. Lewis said he was unsure how long McLaughlin was in custody. It was unclear if McLaughlin had been charged. McLaughlin, who last year was anointed the “chattiest” baseball announcer by the Wall Street Journal, was probably totally pissed off at work the next day. I bet that was weird. Fat guys are supposed to be all jolly and stuff right? McLaughlin filed and won his petition to keep his license while the case was pending. His hearing is set for October 6th, which is nice since fellow Cardinal broadcaster Mike Shannon has his standing monthly drinking and driving hearing on the same day.